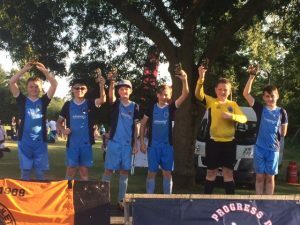 Worplesdon Rangers Football Club » U12s Win Mayford Tournament!! The U12 WRFC Team go on to win the Tournament at Mayford over the weekend. Congratulations to the U12 team this weekend who won their tournament at Mayford. Following this success the team is hoping to push on next season, so are looking for more players for season 2017/18 as they move up to to 11-a-side. So if you know of any under 13 children who want to change clubs and join the best U13s in the world next season, then please send them Sylvia’s email address (sylvia.levick@wrfc.club). Or if they are not in any team, Les and Darren will turn them into amazing footballers anyway! For more information please email sylvia.levick@wrfc.club the U12 Team Rep. There are ‘share’ buttons on the bottom of this post, so please feel free to share this information with everyone you know who has 12 year old kids interested in football (if not, tell them anyway, as they may change their minds). Try out the new ‘WhatsApp’ sharing button! “In blistering temperatures the U12s fought their way to their second 6 a side final in 7 days. Having finished top of their group with 2 wins and 2 draws we faced our old rivals GPR in the semi final. This ended in a 1-0 win to us. So onto the final …., 0-0 at full time, we finally broke the stalemate in the first half of extra time to score. This week we were the winners. The team did not concede a goal all tournament. The WINNERS of the U12 Tournament at Mayford over the weekend.